Legal news for New York medical malpractice attorneys – A NY Supreme Court judge ordered $5.2 million to be paid in medical malpractice case of woman who died after C-section. Albany hospital and 2 doctors in medical malpractice suit sentenced to pay, adhere to policy changes. Albany, NY (www.NewYorkInjuryNews.com) – A NY Supreme Court judge has ordered a $5.2 million settlement for malpractice and ordered procedure changes at Albany Medical Center Hospital as a result of the September 2007 death of a Cesarean section patient who bled to death , as reported by the Times Union. The Albany Medical Center Hospital and two physicians, Dr. Sean Lee and Dr. Cheryl Burrack, were found responsible for the death of Diane Rizk McCabe, of Rotterdam, who suffered internal injuries after the Cesarean section birth of her second child. The judge sentenced that the hospital pay $1 million, Dr. Sean Lee to pay $2.3 million and Dr. Cheryl Burrack to pay $1.9 million. The hospital is also required to pay for the “Diane McCabe Memorial Quality Lecture,” which will focus on topics related to enhancing patient safety. The lecture is mandated to continue for 20 consecutive years. 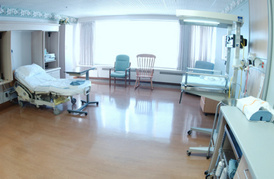 Furthermore, the hospital must purchase a Noelle Maternal and Neonatal Simulator within 60 days of the sentence and change the default settings of its OBIX Perinatal Data System machines. The lawsuit claimed that Dr. Lee and his assisting resident either cut or tore McCabe’s uterine arteries during the Caesarean section delivery of the couple’s second child. As a result, she hemorrhaged while in the operating room, losing approximately 60 percent of her blood volume. Dr. Lee refused to heed calls from the attending physician on duty that McCabe was bleeding internally. Colleagues of Dr. Lee testified they told him she was bleeding and needed to undergo an operation to fix the problem. Lee demanded they wait six hours. Nurses also testified that the patient’s vital signs were not being recorded after the operation. Another physician testified that the surgical center was constantly understaffed. McCabe’s children are 2 ½-year-old Jenna and 9-year-old Louie. Legal News Reporter: Tara Monks – Legal news for New York medical malpractice attorneys.